Snapseed now available on Play Store Free! After a long period of exclusivity for Mac and iOS, the popular photo-editing program Snapseed finally arrives on Android. The nice thing is that the program is completely free! Let's see what Snapseed offers one of the best programs available today to edit photos with beautiful effects. A few months after the acquisition of software company Nik Software by google(which took place last September), Google has released the Snapseed application on Google Play Store for Android smartphones and tablets. 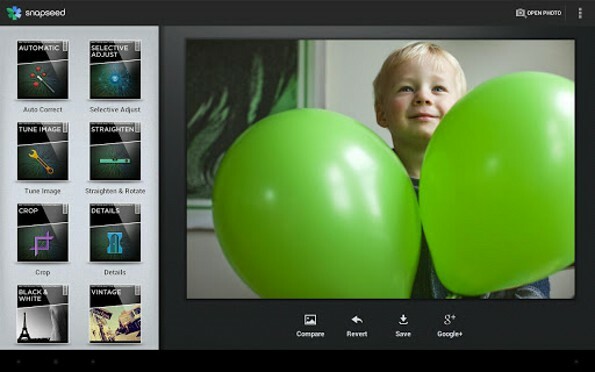 Along with the release of the Android version, Snapseed is also updated on the iPhone, becoming completely free for users. Snapseed, for those unfamiliar with the program, is one of the best software available today to edit and customize photos. Available in time for iPhone, iPad and Mac, has landed a few months ago on Windows. Now, finally arrives on Android. The effects offered by the program to edit the photos are similar to Instagram, but there are many more features that are available and those that characterize each image editing software: In addition to filters, in fact, we can change every aspect of our photos a simple, fast and intuitive. Even novice users will be able to use this program without any difficulties. For example, we edit photos with filters, set different values ​​of saturation, brightness, and more. The end result is truly spectacular and the only limit is your imagination. Note, however, another element that characterizes the program: full integration with Google: images can be published directly via a special button on the social network of Google home, using a UI among other things identical to that of Google. If desired, the images will still be stored in your gallery without uploading them online. At first the program will not immediately be immediate to use, but after a few minutes I'm sure you deal with it without any problem. Try it, it really is a great image editor for Android (but not only).